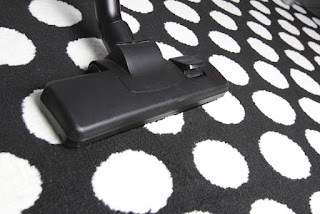 Using vinegar for spot treatment and cleaning for your carpets is one of the most flexible ways you can do this. You can use it by rubbing it on the surface of the stains with a bit of salt added or dissolved into the mix. You can also mix it with borax for an equally good solution. Mix it with cornstarch and you have an excellent, non staining compound that gets the dirt between the fibers of your carpets and helps remove stains. If you need to you can let it stay out for about a day or so before you rub the stain off and vacuum the remains. If you have managed to spill paint, then you will need to use a mix of laundry detergent, water and vinegar to get rid of the paint before it manages to set in and dry off. Rinse it with cold water when you’re done cleaning and you will have no trouble at all, depending on the type of paint of course. Spilling juice or other sugary drinks on your carpets can be a serious issue, especially due to the fact it will make a nasty, sticky mess you need to wash away before it sinks in and becomes worse. There are ways you can solve this and all with a pretty unexpected substance – shaving cream. Just blot the stain right away and follow that up with shaving cream on top of the water. Once you are done with this you will need to allow it to dry off, wiping it with a soft damp cloth. To make cleaning easier for ink spots, you will need to make use of cornstarch and milk to make a fine paste. Use that and apply it to the ink stain to lift it. The mix needs to dry off and it will be on the carpet for a few hours and then brush and vacuum the location to free it up. Do that and your carpet cleaning will be much easier to handle overall. You should never panic if you spill red wine on a light carpet. Even though this may look like a strange decision, the truth is you can use it without any issues at all. Clean the spot with cold water and a sponge by blotting it then sprinkle some salt on it and let it stay for about ten minutes. Once that is dry you can vacuum it. If you have greasy food stains on the carpet then you should use salt and rubbing alcohol to get rid of them. Simply rub the mix into the grease stain and that will eliminate it after a while.